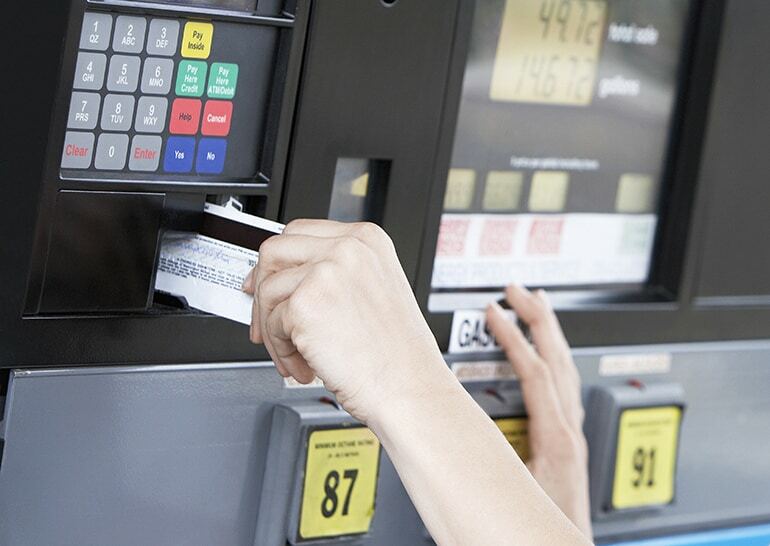 Gas stations process a high volume of transactions daily, so running one can be complicated. Ideally, you want a gas station POS system that can sync with all your locations, increase revenue, and offer time-saving features. From basic functions like fuel pump controller integration, to cash management, to secure transactions, the system you choose should offer solutions to help you run your operation efficiently, even at peak times. Additional requirements for safety controls, role-based access, and integration with back-office solutions should be considered. Also, instant lottery management and modules for restaurant operations, if you offer those services. 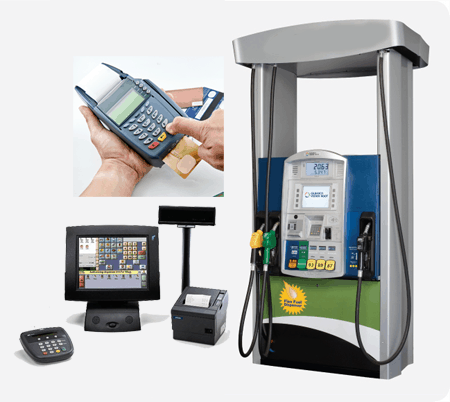 In this guide, we’ll review three top gas station POS systems. These systems are also ideal for truck stops, where loyalty programs and solid reporting is a must. AccuPos’ greatest advantage is that it allows you to manage your gas station business from anywhere and at any time. If you choose AccuPOS, you won’t have to be chained to your station every second of the day. With one password, you can manage staff schedules, access sales data, and plan promotions. Stock management is seamless. The one of a kind integration with Quickbooks & Sage lets you fully manage your inventory via your accounting software. You can scan deliveries and manage inventory from a handheld device using the AccCOUNT software. AccuPOS is accessible on all devices, including PC & Android, so you can browse an extensive collection of durable, reasonably priced hardware and choose what suits you, your gas station, and your staff best. AccuPOS is a very powerful accounting tool, especially when synced with Quickbooks or Sage. Having all the financial data synced and ready saves you and your clients a lot of time when it comes to taxes. If you choose to go with AccuPOS, you’ll save hours of work on doing the books. Accounting tasks can be completed in a matter of minutes. This retail POS connects seamlessly with the accounting software, so all the data is transmitted wirelessly. You don’t have to waste valuable hours re-entering data by hand anymore. In fact, Quickbooks marketplace has ranked AccuPOS number one 7 years in a row. When you hire a new staff member, you need him or her to start using your gas station POS system accurately and as soon as possible. You just don’t have enough time to train them in the software. Gas stations depend on getting staff up to speed immediately. For this reason, the AccuPOS POS software interface is developed to perform simple, intuitive actions that people can master in a very brief period of time. New employees will be perfectly comfortable using this company’s software in just a few minutes. The company’s AccuSHIFT integration is an add-on that allows you to manage staff quicker than ever before. Your employees can clock in and out right on the sales screen, and the data is sent automatically to your timesheets. You can add and remove employees, make corrections, and use customized swipe cards for ease of use and security. There will be no need to do manual timesheets anymore. Finally, AccuPOS’ software will generate online sales reports on a regular basis, be they from the last day of last month’s sale or Christmas two years ago. You’ll know what sells and when it sells best, being better informed moving forward. That’s how gas stations thrive, and retail businesses in general for that matter. It can be a little bit confusing to configure the database. On occasion, you’ll have to wait 10 minutes to speak to first level tech support, but that doesn’t happen that often. They’re usually available immediately. This POS system offers great quality at a relatively low price. It enjoys the trust of a vast number of customers thanks to its efficiency. CStorePro features top of the line, cloud-based technology letting you control your gas station or stations from anywhere. It is easy to set up. The company offers flexible training – you can do a demo or watch their training videos for free. Other advantages include low-cost plans and powerful design and engineering. The combination of business acumen and technology expertise has generated efficient, intuitive inventory control software that's simple to use and brings value to gas station managers, employees and owners. CStorePro had not only the first cloud-based back office in the industry, but also the first mobile price book. Their technology and products are designed to scale and adapt. As the retail sector evolves, you always stay one step ahead. The company takes data security very seriously – data is protected with full safeguards according to the best practices used by banks and financial institutions and in line with all relevant industry standards. All data is stored and backed up on data centers, professionally managed by Amazon Web Services, the world's leading cloud infrastructure and computing provider. Support is just a click away. It is also available via phone or remote screen sharing. The best way, however, is live chat. Whatever method you choose, you will get instant and personal answers to your questions. The company’s experienced support team is fully trained to deal with questions and help clients make the most of the tools and software. We recommend reading their detailed training articles, available from the Help Center on their website. There are also videos and a FAQ section to tell you everything you need to know about the software. It is quick and easy to create accurate day reports to indicate your exact daily short/over, and automatically download credit cards, sales, pay-ins and pay-outs from your POS register to limit the necessity of manual data entry. CStorePro's day reports can be customized to adapt to your business’ unique setup so your reports are always accurate and not made complicated by unnecessary fields. You can also customize your categories and departments, configure your printable and data-entry day report layouts. Also, set up mappings between your POS registers and generate daily reports to monitor key control points. This can be done by scheduling a demo with a CStorePro staff member, where they'll be able to show you a sample tour of a gas station. This way, you'll be able to learn how to add new inventory or use management features, like prepay fuel for a certain pump. If you already have an account with CStorePro, just open a customer support ticket on their website. Finally, this software will let you keep an eye on your fuel SIR reports, merchandise inventory, vendor balances and other important factors with configurable views that can be printed with your day report using online inventory management. When the company first started out, customers would have a hard time getting help due to understaffing of the support team. This has changed, but there is still a response time during peak hours of up to an hour. This software makes managing your business easier than ever, because everything is at your fingertips. The program is very well designed. The features and functionality are outstanding. The mobile app is really great. We really appreciate the fact that you can change prices from anywhere and see your business sales in real time regardless of your location. Our number three pick won us over thanks to their amazingly efficient inventory control. Simply put, you can serve your customers better if you know what you have in stock! Apart from this, POS Nation generates sales reports, tracks employees, and offers custom barcode printing. It helps you get a better handle on the financial status of your operations, manage productivity, and make better staffing decisions. It is easy to create labels on the spot to track inventory. You can create, track and send purchase orders automatically. You will also receive notifications when you need to reorder. Accounting processes are tailored to fit your unique needs, keeping customers paying on time and revenues flowing. We definitely recommend the software’s Customer Sales History feature, because it lets you track customers’ purchasing habits and create targeted marketing campaigns to retain current clients and win new ones. Inventory is managed more effectively using handheld devices, which perform a quick scan. This decreases inventory count errors and improves the overall efficiency of the store. Also, it helps you save countless hours of labor. Gas station managers can make better business decisions with such devices. Impressively enough, POS Nation has more than 70,000 businesses who use its gas station software. They work with a variety of retailers, ranging from independent gas station owners-operators to multi-location chains. Regardless of your individual needs, their adjustable, scalable retail POS system is capable of developing with your business. Typically, their POS system includes a cash drawer, touchscreen computer, barcode scanner, receipt printer, and MSR (credit card swipe). From there, you have many additional options. Pos Nation also offers a variety of add-on POS hardware, including tablets, customer displays, scales, label printers, pin pads, and more. The company is able to easily incorporate tablets into their retail POS system using Windows 8 HP ElitePads. They are ready to offer personalized consultations to learn more about the client’s business in order to offer the best POS system for his needs. If their POS software won’t meet the needs of your retail business, they will make it clear. None that we can could find. POS Nation’s software will help you run your business easily and efficiently. It gives you the information you need to make decisions. You will know how well your goods sell, as well as your margins by department. You can offer promotions to win clients back. When considering a POS system for your gas station or c-store operation, you'll want to consider features like fleet card acceptance, employee scheduling, inventory management, and more. As gas stations receive lots of customers around the clock, gas station attendants or cashiers must process transactions fast. With lines getting longer and longer at the pump, you must remain efficient to keep customers happy. Your chosen point of sale solution should take care of fast transactions, but also offer the ability to accept various forms of payment. As a retail gas station, you need a software solution that's designed for intuitive operation. Make sure the software you select has a friendly and easy to use interface. The easier the system is to use, the more time it will save on needlessly lengthy staff training. This way, your business will experience fewer human errors while processing a payment. I’m running a petrol station business. Lately, my station has been experiencing disturbance to our POS system. We suspect it has to do with some jammer device disturbing our frequency. Is this possible? John, it’s possible. If you’re using WiFi to connect to your POS system and there’s a jammer that’s not letting you connect through WiFi, that could be a problem. I would contact a local Tech or someone from your point-of-sale provider to help you troubleshoot this issue.